I took this picture when I was in Jerusalem a few summers ago. 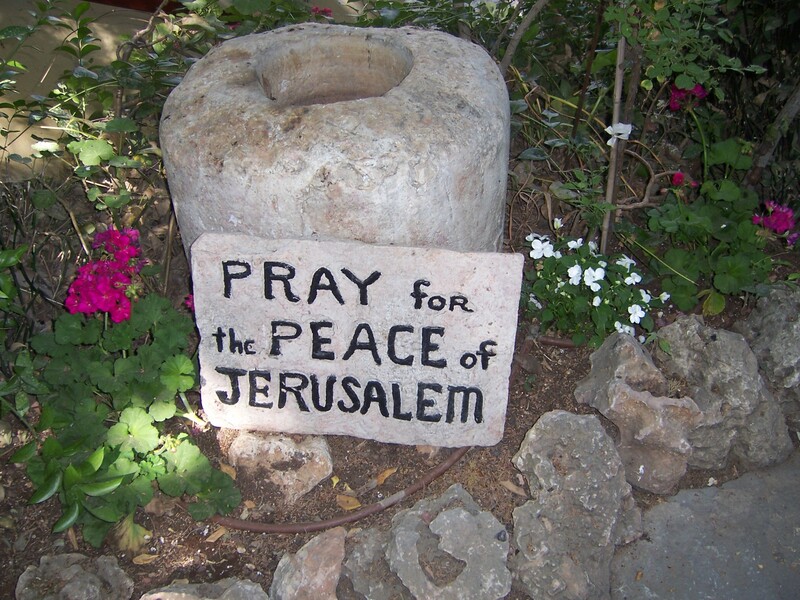 This is not a bad request, though it is a bit ironic when you remember that "Jerusalem" actually means "city of peace." Nevertheless, on this day, the second Sunday of Advent, when the theme is peace, my mind is turned toward peace, the lack thereof, and just how to bring it about. So, should we just pray for peace? Will that work? I think that history has shown us the answer to that question. Our country alone is heavily involved in two wars, dictators abound, senseless deaths of young ones seem endless, the sting of the Holocaust and the genocide in Rwanda and Darfur is still very real, the rich are often made so on the backs of the poor, and people continue to kill in the name of God. And yet people have been praying for peace for thousands of years. I'd say we have quite a ways to go yet. I'm not saying we should not pray for peace, only that praying alone will not bring about peace; we have to work for peace. It's kind of like how James fashioned his response to the "faith versus works" question: Show me your faith apart from your works and I, by my works, will show you my faith. The same could be said of peace: You show me your peace apart from working for it and I, by my working for it, will show you peace. Understanding comes from looking backwards. One day, to those who follow us and who seek to understand us by looking backwards at our lives, by God's grace may they understand that we made peace. "That we made peace." That is active, not passive. Praying for peace is important, but if not coupled with our active working for peace, our prayers will never be answered. So today, on this second Sunday of Advent, I pray for peace and I work for peace.